Pharmaceutical Regulations Book from C.H.I.P.S. This revised fifth edition maintains and enhances the features that made the previous four best-selling and highly acclaimed editions so popular among pharmacy law faculty, students, and candidates for pharmacist licensing examinations. 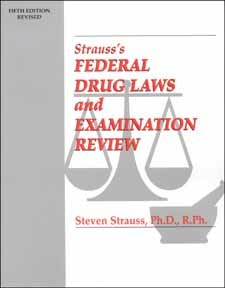 Strauss' Federal Drug Laws and Examination Review's extensive editorial contents and multiple-choice review questions accurately mirror the subjects and format of the Multistate Pharmacy Jurisprudence Examination� (MPJE�) and state law pharmacist licensing examinations. The editorial matter reflects the need for new and expanded information to keep abreast of legal and regulatory developments. Further, the addition of new and revised graphics and tabulations are intended to focus on important facets of law and retention of the topic.